Conner had just completed the Centre for Autism Services Alberta’s popular Kickstart Soccer program, and he wanted more. 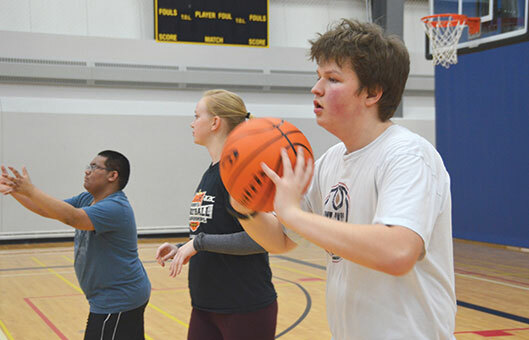 With a passion for activity and shooting hoops, Conner asked the Centre for a Basketball program. a basket. It was just ‘WOW‘. “I liked seeing my parents and the other players cheering me on when I was out on the court,” adds Conner. Conner has come a long way in his athletic endeavors. There was a time, not long ago, when he was not allowed to go to his high school gym to shoots baskets, as time was restrictive to competitive play and intramurals. With game prowess and communication skills developed in programs like Teen Basketball, Conner can now walk onto any court at the University or a gymnasium where people are shooting hoops and fit in with minimal support. “To be able to join in at community basketball and succeed is a huge accomplishment, and we are so proud when we see him beaming with self-esteem and self-worth,” says Sheryl. Besides basketball, Conner loves art, cooking, shopping, mowing the lawn, Centre camps and Teen Night, and his service dog Tulsa. A big fan of Oilers hockey, he has met his hero Wayne Gretzky, who applauded him for his support of Racing for the Cure and other charitable causes.